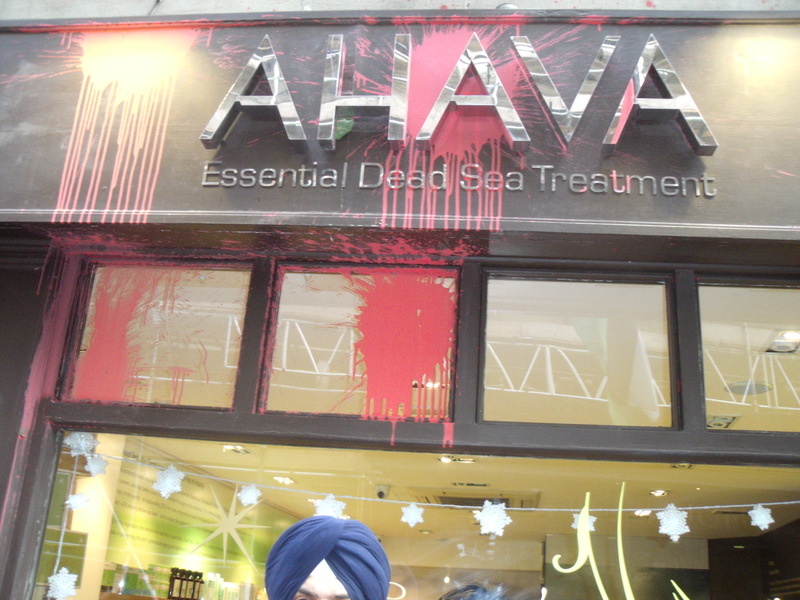 Anti-Semitic protests finally force Ahava to close in Covent Garden. Bloodied but unbowed: Ahava after a recent attack. What a shame that Ahava’s landlords have finally succumbed to pressure from Ahava’s neighbours not to extend Ahava’s lease due to the regular noisy protests in the vicinity of Ahava. And for anyone in doubt as to the true nature of the anti-Ahava protests one only has to glance at the website that promotes them to find rhetoric and images that equate the plight of the Palestinians with the plight of the Jews under the Nazis. If anyone really think that these protests are simply about Israel’s so-called occupation and Ahava’s production plant being located on the “West Bank”, then they are seriously deluded. And the protests call for a boycott of Israel, not just Ahava (see end photo). The reason that the lease was not extended has nothing to do with the landlord disagreeing with Israeli policy, but all to do with the noisy anti-Ahava protests, which some of Ahava’s neighbours ran to the landlord, like squealing little schoolboys, to complain about. That last comment does not ring at all true. The anti-Ahava protests have been taking place for around about 15 or 16 months at the most and relations between the shops were very friendly before the protests started. Now, instead of condemning the anti-Israel protests for causing the nuisance, quite incredibly, Mr George has condemned Ahava! One might disagree with the legality of the “settlements”, but that is just conjecture, opinion and a matter of interpretation. There is no law anywhere that states the “settlements” are illegal. We could debate their legality and morality until the cows come home (and have a very interesting discussion over it). Therefore, the protests outside Ahava really come down to one thing; the existence of the Jewish state. 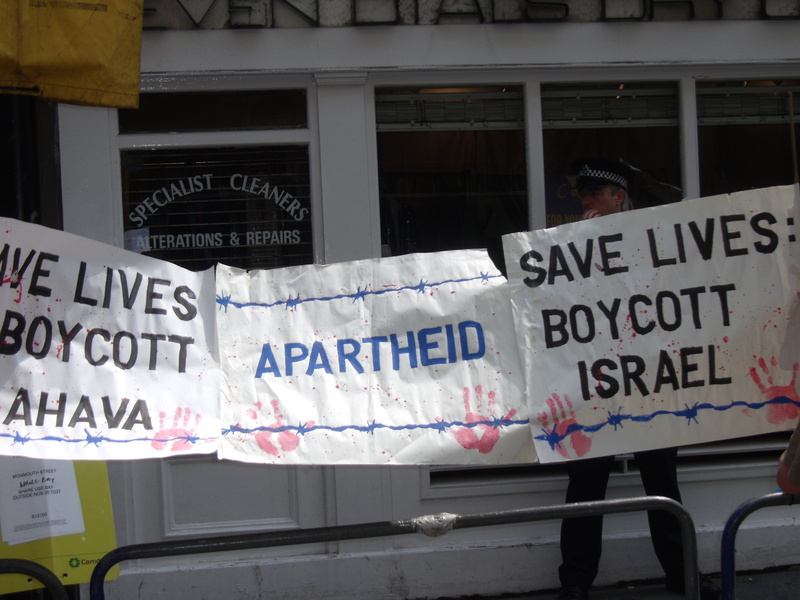 If I am wrong and the protests are simply about Ahava and so-called Israeli oppression of the Palestinians then virtually every shop in London should have a regular protest outside it for breaching some form of morality or law. Sweat shops in China, anyone? And if the anti-Ahava protests are simply anti-Ahava then surely they have achieved their purpose. They have managed to shut down Ahava and so will not need to take place anymore. My bet is that the protests will continue. They are more about defaming the Jewish state than anything else, and that says all you need to know about the nature of the beast we are dealing with here; anti-Semitism. And in this specific instance I am not playing, what some call, “the anti-Semitism card”. Are these protests really about Ahava? Sami Khiyami: "Israel could be behind any bad thing in world." It was an almost comic exchange on BBC’s Newsnight (the exchange begins at 17 minutes) last night when Jeremy Paxman interviewed Sami Khiyami, the Syrian Ambassador to the UK, over who was behind the plot to destabilise Syria. “Ambassador: Syria is not a one party state, it is not a one family state. It is the nicest and most beautiful state in the Middle East. Paxo: Ok, now you’ve got that off your chest, tell us about this plot, who’s behind it? Amb. : I think all those who thought Syria is at a time when it will cash in on the result of the revolutions in Egypt and Tunisia. The changes that occured in the Arab world were about to help the Syrian position a lot towards Israel and the expansionist policies of Israel. Paxo. : Basically, it’s the Israelis behind it, is it? Paxo. : Is it the Israelis behind it, is that what you’re saying? As ever, Paxman looked in on disbelief. Then again Khiyami was only parroting the line of President Assad of Syria who spoke of an “Israeli agenda” in his speech yesterday about the violence currently taking place in Syria. The Times reports that a 14 year-old boy was yesterday shot in the head while carrying an olive branch. And many dozens so far have been murdered in cold blood at the hands of Assad’s forces (has anyone seen Judge Richard Goldstone lately?). Some claim that Assad is basically a reformist President, but one who is kept in a straightjacket by hardline conservative elements in his Ba’athist administration. Nevertheless, Syria hosts Hamas, supports Hezbollah in Lebanon and will do anything that Iran commands it to, especially considering that the Assads are Alawite, an offshoot of Shia Islam. The majority of Syria are Sunni Muslims. I would have liked to have seen Paxman ask Khiyami whether there could be a repeat of events in Hama in 1982 when Assad’s father massacred up to 20,000 of his own people the last time they were impertinent enough to attempt a revolt against Assad totalitarian rule (Here is Robert Fisk reporting on his visit to Hama in June 2000). 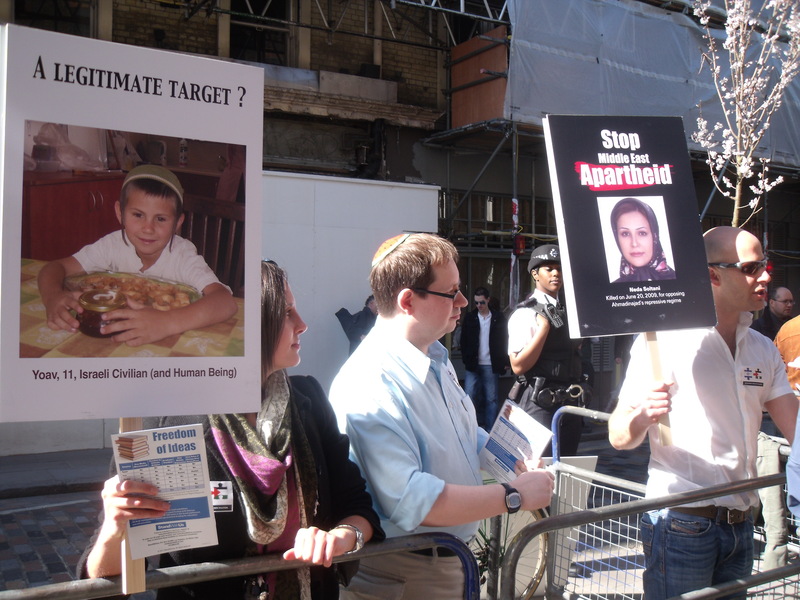 Anti-Ahava activists on trial: A view from the public gallery. As has been reported in the Jewish Chronicle, last week four anti-Ahava activists stood trial for entering Ahava. The activists lay down on the floor and locked themselves onto a heavy concrete block causing Ahava to shut down and lose business. There were two separate incidents. The first incident, involving two activists, took place on 2nd October 2010 and the second, involving another two activists, on 22nd November 2010. 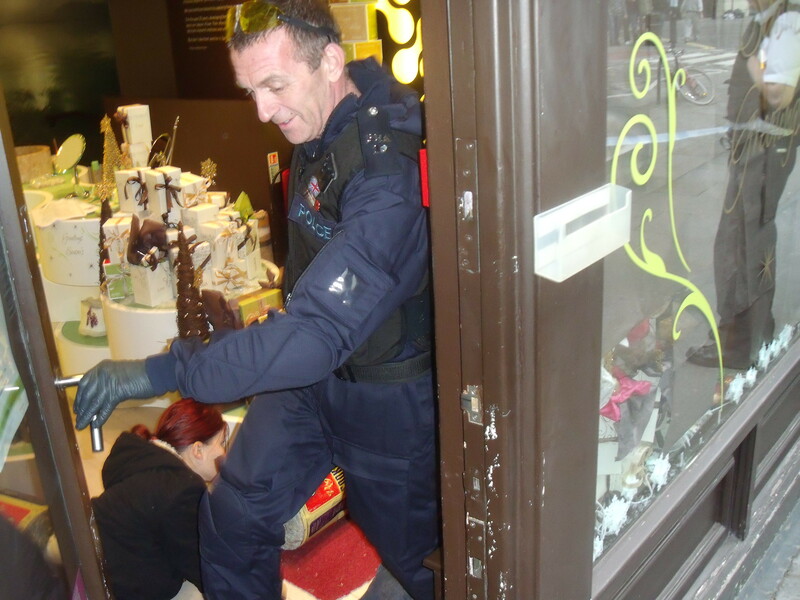 Fellow activists helped to carry the concrete block into the store on each occasion. The two incidents were combined into one trial, but the four defendants were charged slightly differently. The two activists from 2nd October were charged with aggravated trespass under S68 Criminal Justice and Public Order Act 1994, while the activists from 22nd November were charged with not obeying a police officer after being asked to leave under S69 of the same act. The trial lasted three days. I arrived half way through day two and for the remaining one and a half days sat in the public gallery next to anti-Ahava activists. Some were dressed in “boycott Israel” T-shirts and others wore “boycott Israel” badges. The Ahava staff and relevant police officers had already given evidence but I followed the examination and cross-examination of the four defendants. I expected debate over the legality of the “settlements”, one of which houses the Ahava factory at Mitzpe Shalem (Ahava’s HQ is in Tel Aviv). The Defence claimed that the “settlements” were illegal and that this tainted all Ahava’s activity as illegal and that the defendants were merely trying to stop this illegal activity when they entered the store on the dates in question. Under S69 an offence is committed if a police officer “reasonably believes” that an aggravated trespass has been committed and having asked the people to leave they fail to do so as soon as is practicable, as was claimed happened on 22nd November 2010. 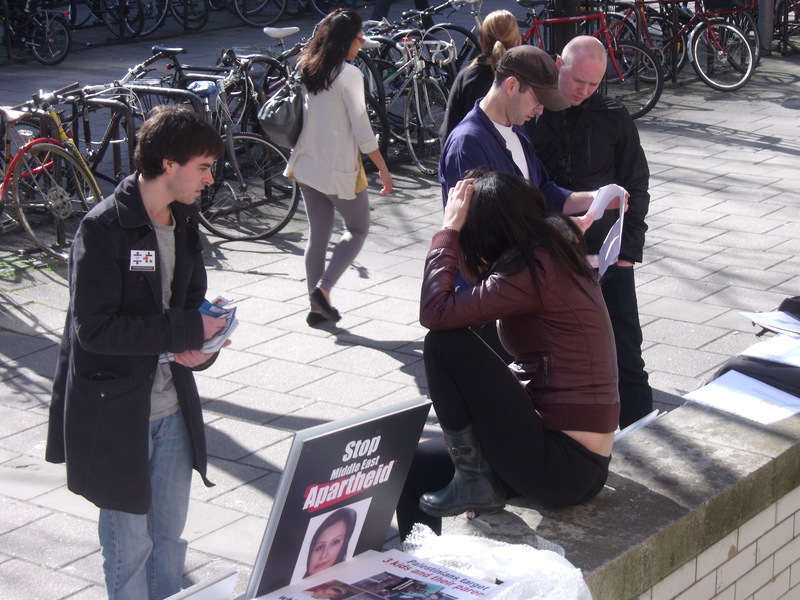 The Defence arguments under S69 centred around the suggestion that the police officer could not have formed such a reasonable belief because he did not, for example, read the leaflets presented to him by the activists or phone up Camden Trading Standards to enquire about the ongoing investigation into Ahava’s labeling. The defendants also claimed they could not have left when asked as they were locked to the concrete block, although the Prosecution queried whether this defence could apply when the activists had intentionally got themselves into that position. The Prosecution also queried whether the activists could have asked their friends for help in lifting the concrete block and removing it from Ahava. The Defence said that this was a physical impossibility once the activists had locked themselves to the concrete block. They would have to wait to be cut free by the police. Ongoing domestic investigations against Ahava were a part of the Defence’s case, although Mr Milner, prosecuting, said that there were no outstanding convictions against Ahava. On the definition of “lawful activity” in S68 Mr Milner asked each of the four defendants whether it was possible for someone to consider the “settlements” to be legal (in contrast, no one would consider murder to be legal)? Each defendant said it was possible, although they wouldn’t agree with that notion themselves. He also questioned them as to why, for example, they didn’t wait for the outcome of the investigations against Ahava, particularly that undertaken by Camden. The Defendants felt that all the investigations were getting nowhere. They felt that Camden was dragging its feet and that questions asked in Parliament about Ahava by Dr Phyllis Starkey and Andy Slaughter MP were not acted upon. Therefore, they felt they had no choice but to do what they did. Mr Milner also put it to the Defendants that Ahava sold certain products that were not from Israel and that, for example, the staff were employed lawfully. Therefore, the defendants were, at least in part, obstructing “lawful activity”. The Defendants replied that all Ahava’s activities were tainted by illegality. Mr Milner suggested that the actions of the activists amounted to vigilantism and that in a democracy people do not normally act in this way, but go about other ways of protesting something they dislike. CCTV footage was played of the activists entering Ahava. We saw an Ahava member of staff running forward to try to prevent the activists locking themselves to the concrete block. This went to the question of possible intimidation under S68. The Ahava member of staff was also concerned that she would lose money if she couldn’t reach her bonus target if Ahava had to close while the activists were inside. The Defence denied there was any intimidation and it was claimed that the police had found the activists a joy to work with. The Defence also denied there was any damage and noted that in the EDO case there was thousands of pounds of damage caused and the defendants were acquitted, whereas at Ahava there was minimal, if any, damage caused. The Defence attempted to implicate the Ahava staff in Ahava’s alleged illegal activities and imputed full knowledge to them due to the regular protests outside Ahava. A Defence barrister pointed to the public gallery to the activists who regularly protest outside Ahava as evidence that the employees would have had full knowledege of what Ahava was doing. The Defence also claimed that the “economic pull” of the Ahava factory at Mitzpe Shalem amounted to a war crime under S49 of the Geneva Convention and that Ahava was in breach of the EU-Israel preferential trade agreement. The judge queried whether, even if Ahava was in breach of this agreement, that would make the actual products sold by Ahava illegal. Judgement was reserved for a later date. Pro-Israel activist brutally attacked at “Celebrate Palestine” festival. As many will be aware by now a pro-Israel activist was brutally attacked at the “Celebrate Palestine” festival at SOAS today. Allegedly, the activist was told by a festival-goer that the Jews were cowards for walking so meekly into the gas chambers, that it was a shame the Nazis didn’t finish the job and that it is a shame it can’t happen to the Jews now living in Israel. The activist was then, allegedly, bitten on his cheek by another festival-goer. The attack drew blood from the pro-Israel activist’s cheek and there was blood around the alleged assailant’s mouth. Film will eventually be released of the attack as well as of the aftermath. Arrests were made and the pro-Israel activist went to University College Hospital to be treated. One would like to say that the “Celebrate Palestine” festival lived up to its name, but, as stated in my previous blog, one of the introductory speakers was more concerned with viciously tearing down Israel and Zionism, instead of celebrating Palestine. “If we understand Palestine, first we have to understand Zionism. And what is Zionism? Zionism was never about self-determination. This is a myth and this is a lie. Zionism is about colonialism, Zionism is about supremacy. When we talk about the struggle of the Palestinian people, we are talking about the struggle of indigenous people, of native people. This is about indigenous people resisting a foreign occupying presence. When we look at the aboriginal people of Australia, over 500 nations were genocided (sic) to create one. We look at Christopher Columbus, we look at Captain Cook, they have a brother in Theodore Herzl, a brother in supremacy. Why are we allowing this settler ethnic cleansing entity to continue to wreak havoc on the world? As much as that may pain some of us to admit, this is the case. We are not talking about a normal country when we talk about the state of Israel, we are talking about a state which has invaded and occupied every single one of its neighbours from Syria to Lebanon to Egypt. Why is this ok? Why is this something we are allowing to happen, that this government is fully supporting? From the Balfour Declaration to now, why is it supporting this colonial conquest? All the European states are in full agreement that the settlements that currently house over half a million illegal Israeli settlers on Palestinian land, all of them are in agreement that the settlements are illegal. But why is there this continued collaboration of the EU with Elbit Systems, with the weapons manufacturer of unarmed drones that wreaked havoc on the Gaza Strip? Everyone knows the settlements are illegal. This state is expanding. It is an expanding state in the middle of the Middle East. It is an expansionist state. It is a state involved in expansion. (Lowkey begins at 2mins 50secs. Before that is Karma Nabulsi finishing her talk). Palestine festival organisers call police to remove peaceful pro-Israel protest. 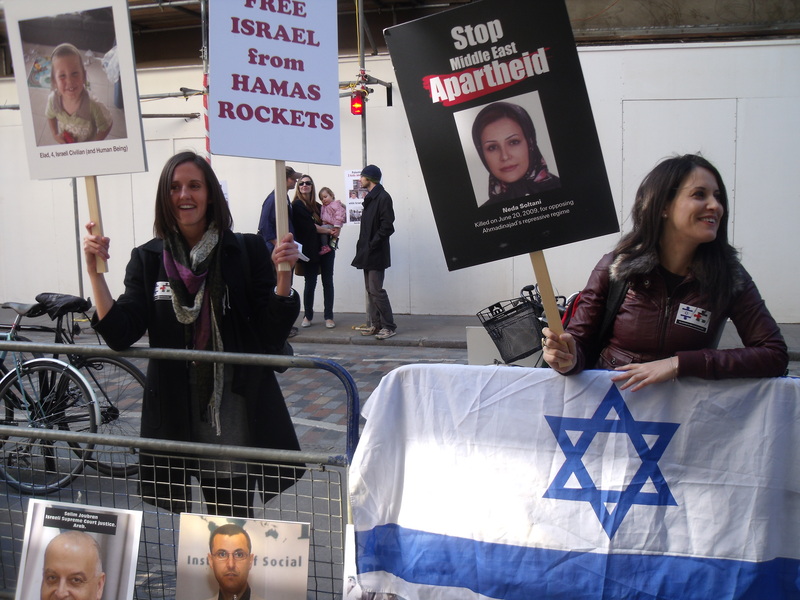 A small pro-Israel protest was held outside the “Celebrate Palestine” festival at SOAS today, but it wasn’t long before the organisers complained to security who called the police to have the protest removed. 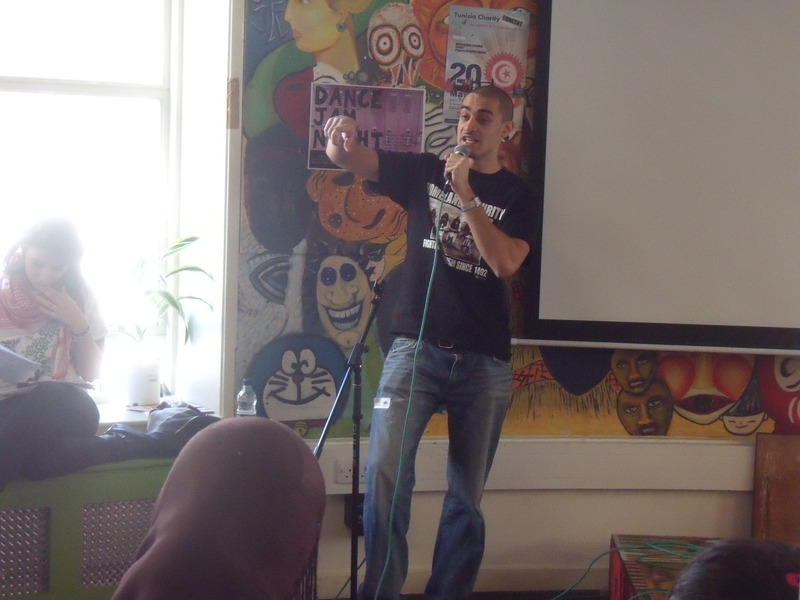 While the pro-Israel protesters were outside arguing their case to remain, inside Lowkey was rapping to the students about Israel being an apartheid, supremacist, colonialist state. Back outside the police eventually relented after realising how ridiculous it would be to remove a peaceful, static protest. 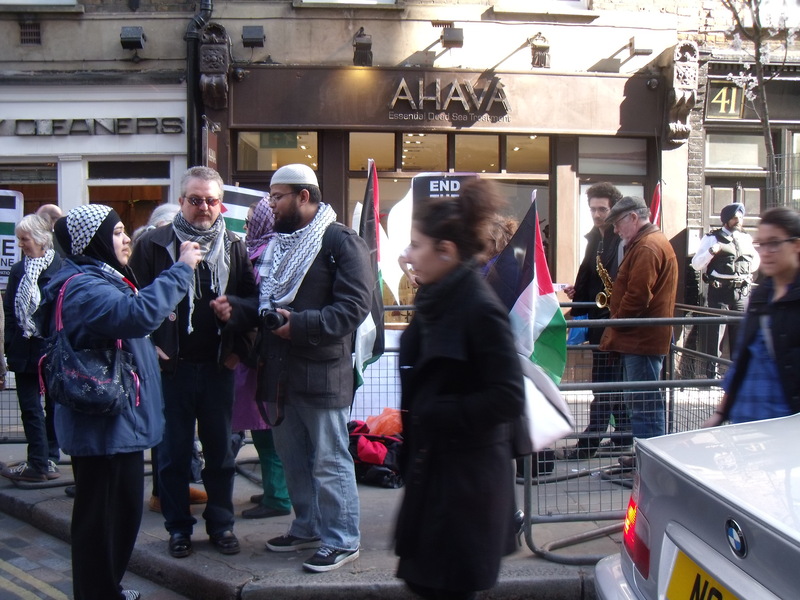 The protesters then moved on to Ahava in Covent Garden outside of which an anti-Israel mob had congregated for their usual Saturday hate-fest. Ahava seemed to be doing alright and my friend, Ian, presented me with one of their Lavender and Chamomile Warming Pads as a belated birthday present. When someone erected a placard with photos of the massacred Fogel family it was immediately surrounded and covered up by a Palestinian flag. Anti-Israel protesters were parroting the line from Palestinian Authority affiliated news agencies that the massacre at Itamar was committed by a Thai worker. Well done to Stand With Us UK which produced the placards, leaflets and very eye-catching “We support a two-state solution” stickers. 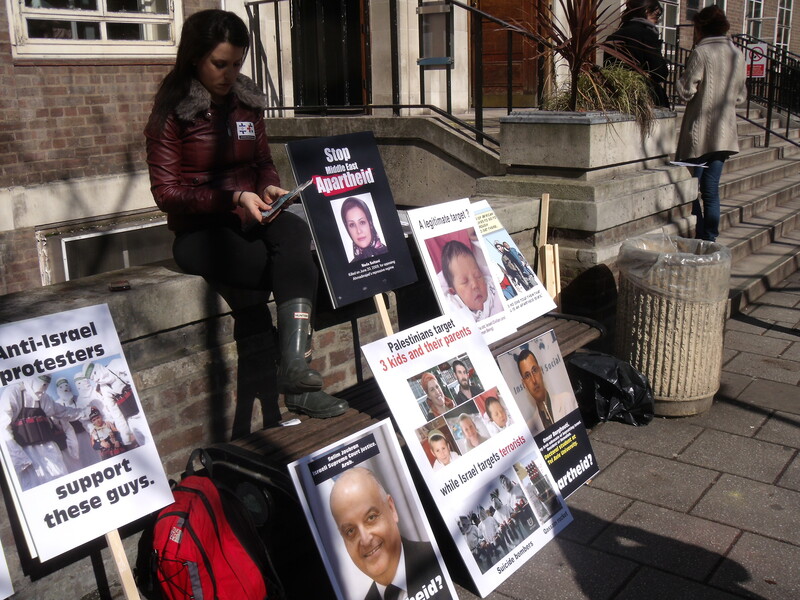 Peacefully protesting outside SOAS before the police were called. Explaining Israel's case to a student. Lowkey rages against the "Zionist state" in the JCR at SOAS. Covering the placard of the murdered Fogel family with the Palestinian flag. Standing up for Israel and for all the oppressed in the Middle East. TravelPalestine advert banned by ASA. 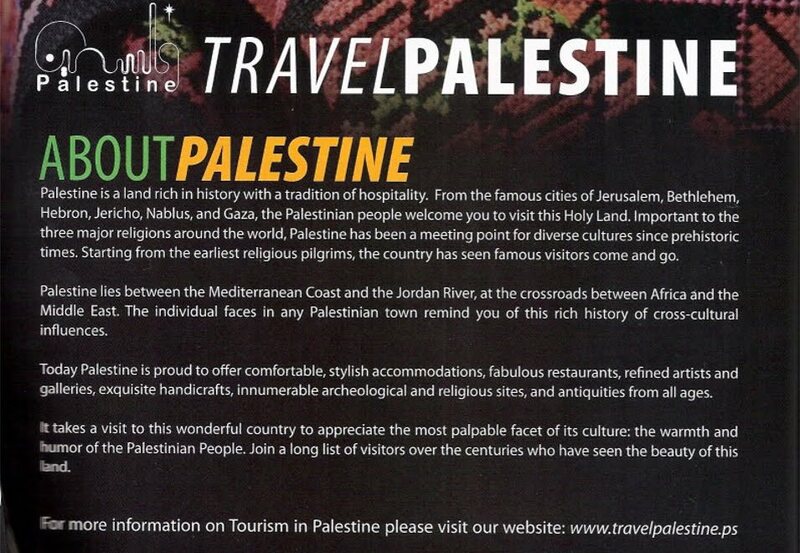 TravelPalestine advert (click to enlarge). 1. Palestine was not a recognised country. 2. It was misleading to describe Palestine as being between the Mediterranean Coast and the Jordan River, when Israel is also there. 3. It was misleading to suggest Jerusalem was part of Palestine. 1. 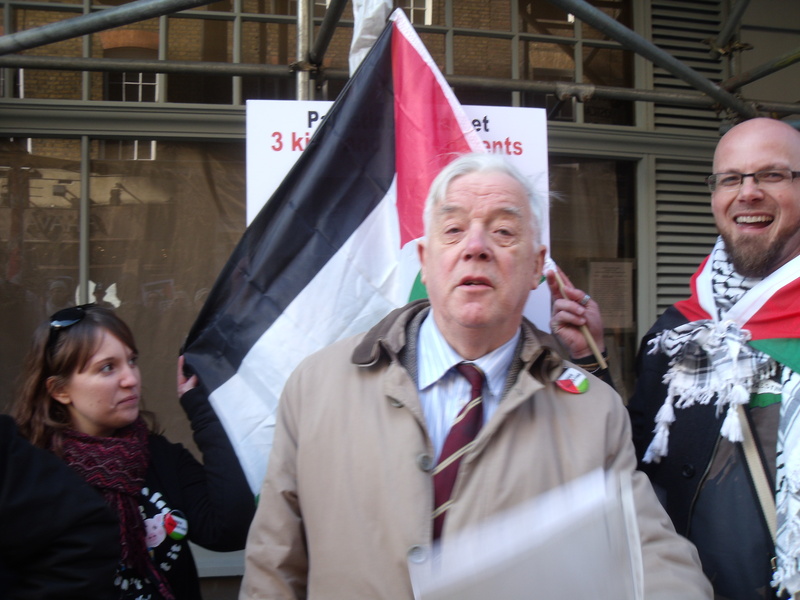 Not upheld – The advert did not claim that Palestine was a recognised country and, so, was not misleading. 2. Not upheld – Not misleading because the description “between the Mediterranean Coast and the Jordan Sea” did not suggest the whole area was Palestinian-administered territory. 3. Upheld – The status of Jerusalem is in dispute. “From the famous cities of Jerusalem, Bethlehem, Hebron, Jerischo, Nablus and Gaza…Palestine lies between…” was misleading because these cities are not universally accepted as being part of Palestine (the latter five cities were not the subject of the current complaint). The ASA ordered that the advert must not appear again in its current form and that future adverts must not suggest that it was universally accepted that locations were part of Palestine when they weren’t. It is a shame it came to this. 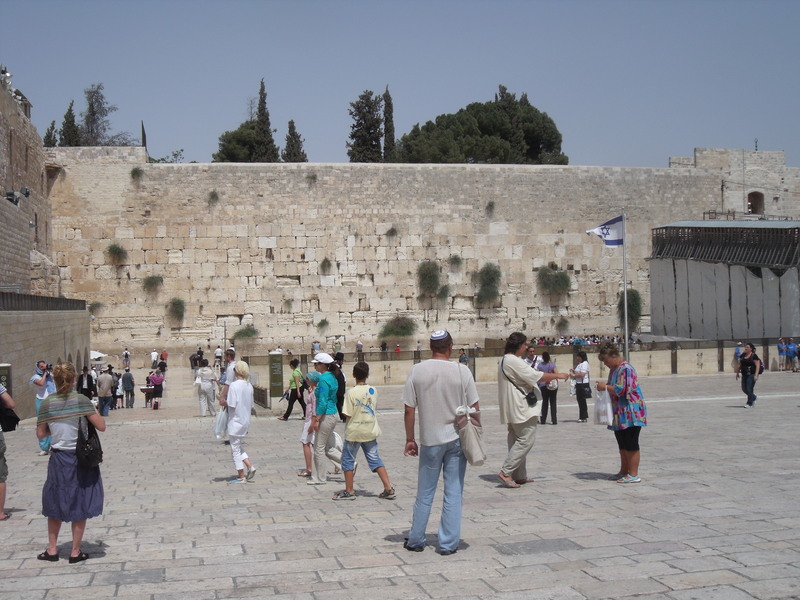 Jerusalem is an increasingly impoverished city for all the people that live there. Jerusalemites desperately need tourism but we now seem to be at the ridiculous juncture where neither Israel nor the Palestinians can advertise Jerusalem. Not only that but, unprompted, the ASA went further by making it difficult for TravelPalestine to advertise ANY of the cities that the Palestinians are claiming! It just goes to show that those who try to tear down Israel will only be tearing down the Palestinians as well. But then again, as we know, most of them don’t really give a damn about the Palestinians. It’s the Jewish state, stupid. Hypocrite of the Month: Vote now. March has been a busy time for hypocrites, so before the list grows any longer now might be an appropriate time to take stock of those who say one thing at one time but say another when the situation suits them. Please vote at end. When Israeli agents, allegedly, assassinated a Hamas terrorist in Dubai William Hague, then shadow Foreign Secretary, stood shoulder to shoulder with then Foreign Secretary David Miliband in his condemnation of Israel for using faked foreign, including British, passports and was in full agreement with Miliband’s decision to expel an Israeli diplomat from the London embassy. Last week Hague sent in that secret service mission to eastern Libya to make contact with rebel forces only to find them detained by those rebels in the confusion when the secret mission dropped in from a helicopter in the the dead of night. And the mission was found to have in their possession…….faked foreign passports. Shami is the director of human rights group Liberty and in this capacity behaves as the conscience of Britain appearing regularly on BBC’s Question Time to berate the government over such human rights laws as the length of detention without trial for suspected terrorists. She is also a member of the council of the London School of Economics and was part of the decision making process that allowed LSE to accept a huge donation from Colonel Gadaffi. She accepts she was fooled but fooled by what? Didn’t she know the human rights situation in Libya? Howard Davies resigned as Director of LSE but there is, currently, silence from Shami. Omar detests Israel and ideally wants it gone as a Jewish state. He lives in Ramallah but is studying for a Ph.D at Tel Aviv university while calling for boycotts, divestment and sanctions against Israel, which includes an academic boycott. Meanwhile, he consumes Israeli products on a huge scale, taking for himself the best Israel has to offer. Last week nine children were accidentally killed in a NATO air strike when trying to knock out Taliban positions but the UN has been silent. When Israel killed nine terrorists aboard the Mavi Marmara there was a worldwide outcry and the UN called for a full investigation. While calling vociferously for successful revolutions against the ruling autocrats in Arab countries you will be hard pushed to find STWC support for the opposition in Iran despite the murders, arrests and sackings of opposition figures and anyone who dissents from the murderous ways of the evil Ahmadinejad/Khamenei twins. And despite the fact that Iran had been caught red-handed trying to heavily arm the Taliban in order to kill NATO troops. On Tuesday night BBC’s Newsnight gratuitously introduced the anarchist Noam Chomsky as being “Jewish” in a piece about the left-wing liberals in the West. I thought the time had passed when someone’s religion is relevant. In the following piece Jeremy Paxman went on to interview Chomsky who was then allowed to air unchallenged attacks on Israel. A bit of fun amidst the gloom, unless you are a QPR supporter. QPR are on the verge of promotion to the Premier League but now stand accused of failing to properly register a player when they signed him in 2009. This could lead to a big points deduction and the end of their hopes of reaching the big time. When QPR’s current manager, Neil Warnock, was managing Sheffield United in the Premier League West Ham United had incorrectly registered Carlos Tevez. It was argued that West Ham should have had points deducted. This would have relegated them instead of Sheffield United. There was no points deduction and Sheffield United were relegated. Warnock claimed that Sheffield United would have stayed up if the rules were adhered to. Now the boot is on the other foot can he morally argue against a points deduction for QPR if they are found guilty?